Arroz con Leche, or milk rice pudding, is truly a dessert of the world. Though it likely originated in Spain or the Middle East, it is popular in many cultures and each adds to this dish a particular flavor or ingredient. In Lima, it is believed that this dish was made popular by nuns at the Convent of Santa Clara, which was founded in 1606. 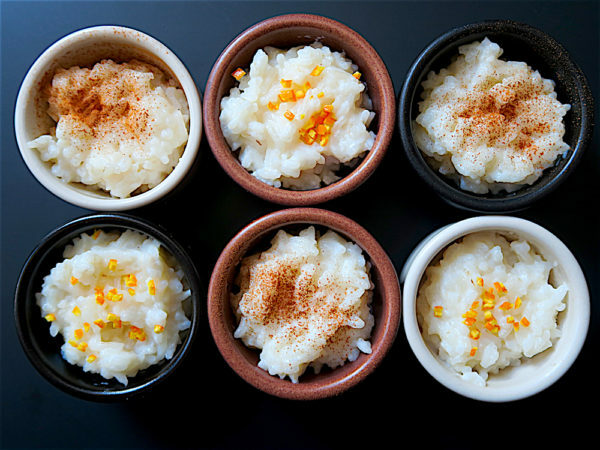 Though there are many variations, the method is universal — slow cook the rice with milk and sugar to form a thick, creamy, warm, and sweet dessert. Some recipes call for cooking the rice with a lemon peel or zest for more flavor, while others add eggs or sweet and condensed milk for a creamier consistency. In this recipe, the rice is first cooked with water and spices, then thickened with milk and sugar. In addition to the ingredients above you’ll need a pot with a thick bottom to cook the rice, a wooden spoon for stirring, a bowl for washing the rice, and tweezers. Wash the rice in a bowl with running water until the water runs clear. Combine the rice, water, salt, cinnamon sticks, cloves, and orange peels in a large uncovered pot over medium to high heat and bring to a boil, stir occasionally to prevent the rice from sticking to the bottom of the pot. When the water level lowers to the level of the rice, reduce heat to a simmer and partially cover, continue to cook until all the water has been absorbed. Turn off heat, use a tweezer to remove the cinnamon stick, cloves, and orange peels, then stir in the vanilla extract. Serve warm in small bowls or ramekins and garnish with cinnamon dust or orange peel zest. This recipe yields about 4 cups, or 8 servings, 1/2 cup each. After washing the rice, steps 2 and 3, cooking the rice with water, should take about 15 minutes. Step 4, thickening the pudding with milk and sugar should also take about 15 minutes. When stirring the rice with milk and sugar in step 4, occasionally scrape the entire bottom of the pot with the stirring spoon in a sweeping motion leading with the back of your hand — from left to right if you are right-handed. If you can see the bottom of the pot during the sweeping motion, then the rice pudding has the right consistency and is ready to be served.